ANGEL has been scrubbed inside and out, we have new batteries aboard and now we are ready to explore! 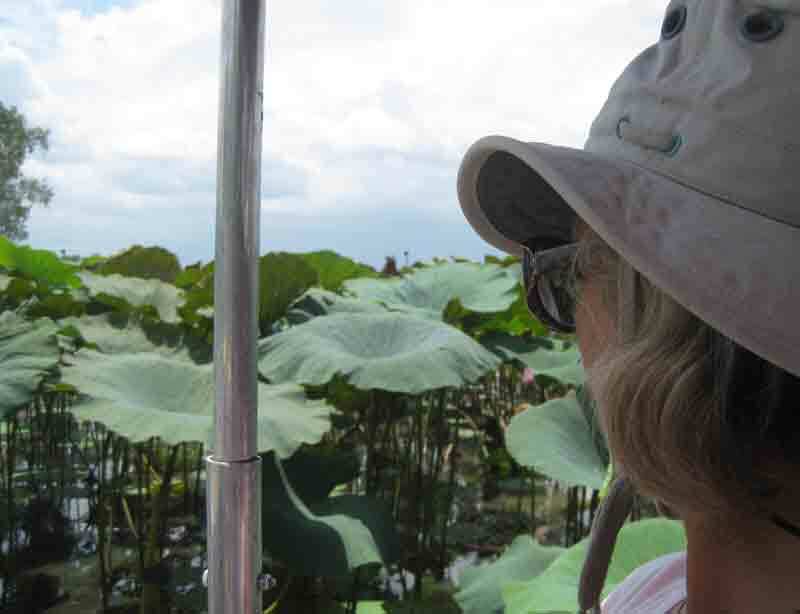 Several of our cohorts have driven to Kakadu National Park for three days, overnighting in a hotel. The summer Jonathan turned 18 we travelled to Kakadu for a weeklong hiking and camping tour. It was spectacular and, we feel, the only way to visit it. This way one learns some of the way of life of the Aborigines and truly experiences the beauty of this wilderness. One also senses the spirituality attached to the area. We did not want to go there this time and be disappointed. Instead we decided to do some day trips. Our first and most wonderful tripmwas along the Stuart Highway to the Arnhem Highway, past HUMPTY DOO to the Corroboree Billabong. I loved the wildlife cruise in Yellow Waters so many years ago and hoped this would be its equal. It actually surpassed it! Dave was a bit dismayed to learn that I had booked a three hour tour (he was hoping for one hour). He DID ask me to do the booking! I figured one hour was too short and if we were driving three hours return, we should at least have three hours of entertainment. We were going to arrive too early so we took a side trip to the nearby Window on the Wetlands interpretive centre. It was a delightful and informative exhibit with a lot of hands-on activities. It was a great introduction to what we were about to see. Also, it was free. We were very surprised to find David and Sue from ENCHANTRESS and Ian and Glenda from LUCY ALICE at the tavern waiting for the shuttle to the billabong (a permanent body of water). They had planned to go on the earlier one-hour tour. I guess it was all that canny scots blood in the group that decided I was getting a better deal for three hours ($60.00 each, including shuttle and lunch) than they would get for one hour ($35.00)! We all had a real treat in store. The bus ride was an inferno. Luckily it was for only 15 minutes. Along the water there was a refreshing breeze (the first since we arrived in stifling Darwin). We were expecting a large fancy boat (as in Yellow Waters). Instead there was a low-lying swamp boat, with no toilets! However, in this climate one drinks and drinks and never needs to use the facilities, so no worries! This swamp boat was highly manouevrable and could travel in 6 cm of water. Whenever anyone pointed out something interesting, our guide whip us around and let everyone have a good look. 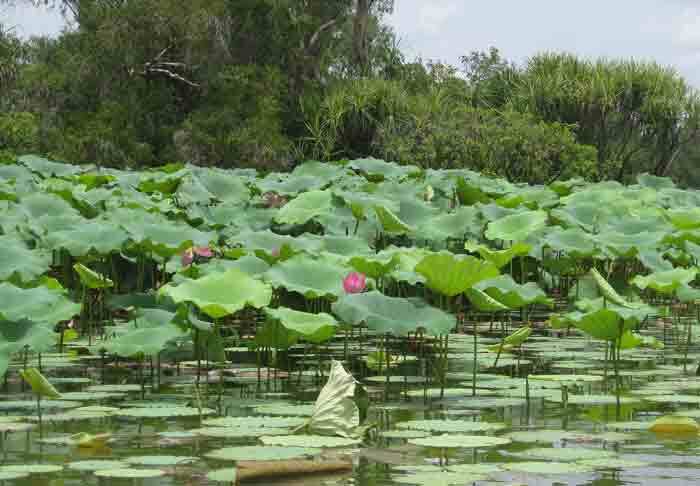 We started out cruising along banks of lotus flowers. Here and there we spotted snake-necked darters. Like albatrosses, these birds have no oil glands to waterproof their feathers and can drown if submerged. They need to dry out between fishing attempts. One of my favourite birds is the Jacana or Jesus bird. 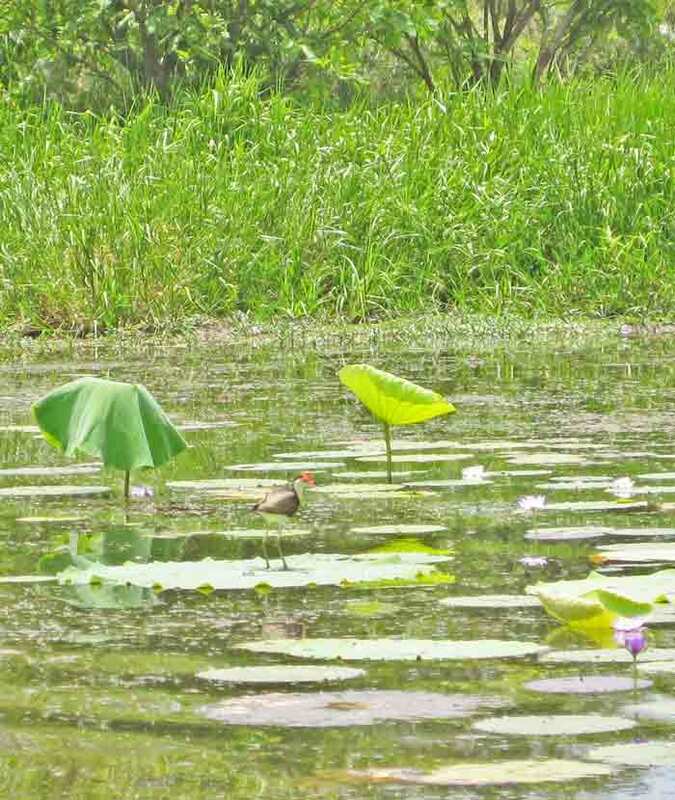 These birds have long "toes" which enable it to walk between lily pads, almost as if it is walking on water. The male hatches the eggs and looks after the babies. If danger is near, he scoops them all up under his wings and all that can be seen of them is their dangling legs. Sorry about the poor picture- these birds are quite tiny. One of the stars of the wetlands is Australia's only stork, the Black-necked Stork or Jabiru. These birds stand about a metre and a half high and are very striking. We only saw one in Yellow Waters. Here we saw eight! 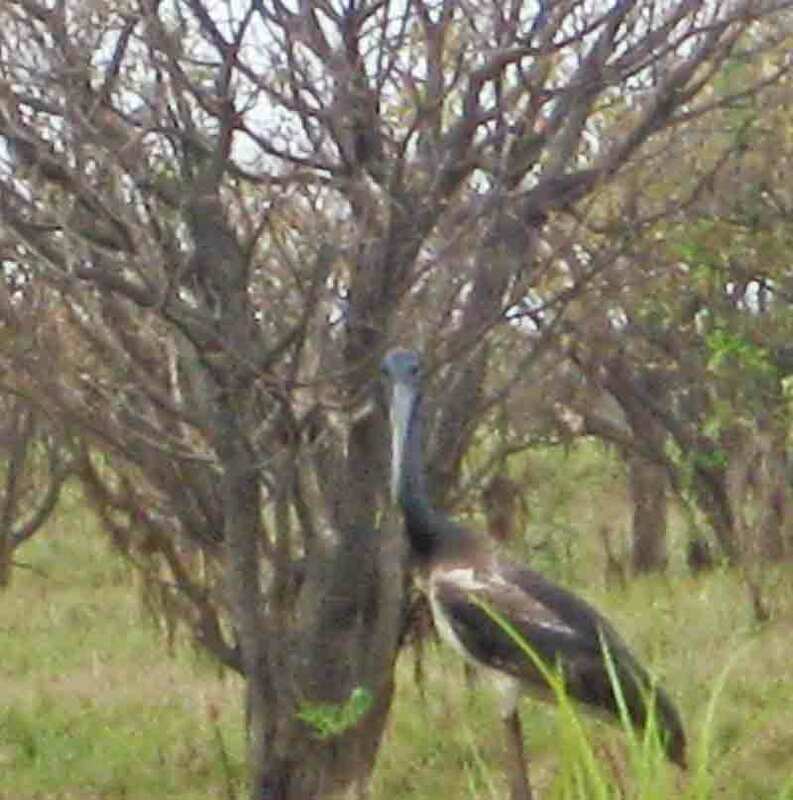 an adult Jabiru- an arresting sight! Lunch was a delight. 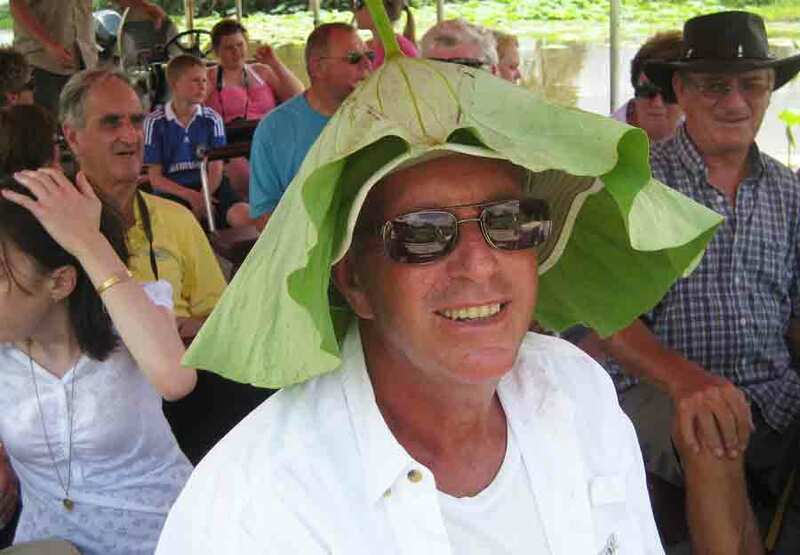 Our guide, Ian, drove right into a field of lotuses and served us our salad and coldcut lunches-DELICIOUS!!! We learned how versatile the lotus is. Not only are they beautiful, but the pods can be eaten. The stems too are important. When eaten they are a good source of clean water. They taste rather like a milder, more delicate form of celery and are full of moisture. Since the roots filter the water, this is clean moisture to imbibe. The hollow stems can also be used as a snorkel. The uses of the leaf are plentiful. A very important feature of the leaf is its impermeability. Rainwater collects in the hollow centre. These leaves can be snapped off at the base water placed inside, then drawn shut at the top to make a canteen. When it is raining the leaf can be made into a rainhat. Doesn't he look adorable- not to mention dry-headed? 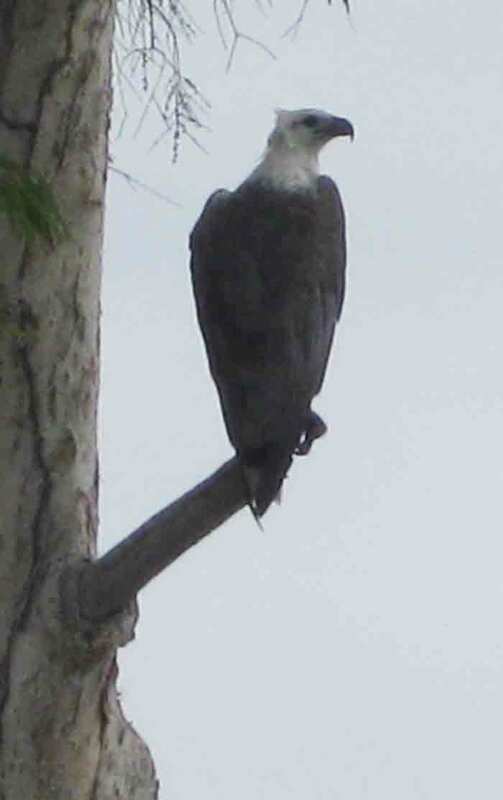 One bird all you crossword puzzle solvers out there might be interested in is the Sea Eagle or Erne. They are highly territorial and have huge nests. 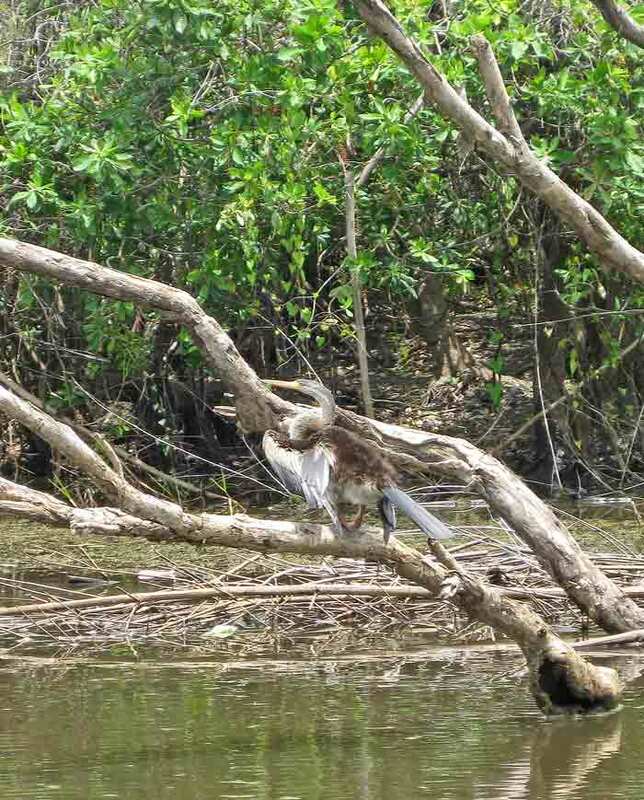 Normally these birds are difficult to find, but this one practically posed for us! 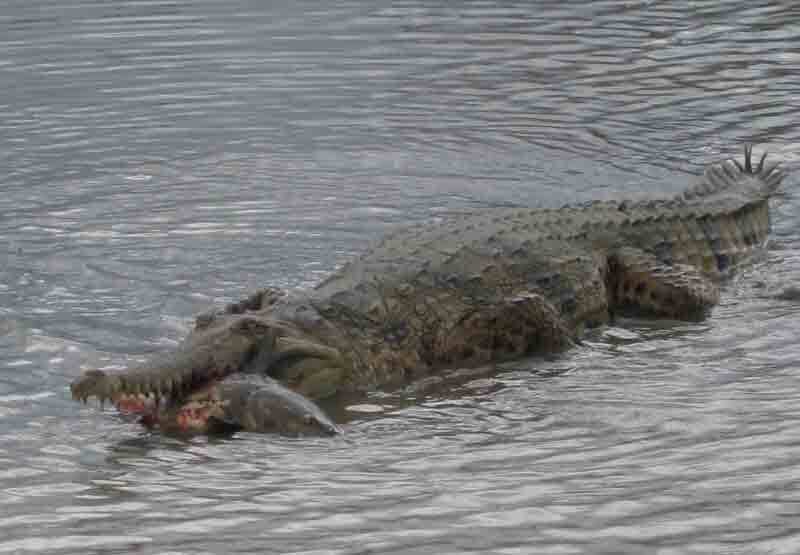 We passed the afternoon looking for crocodiles, both freshwater (Freshies) who spend their entire lives in fresh water and saltwater (Salties) ones who spend part, but not all, of their lives in saltwater but most of their lives in fresh or brackish water. The estuarine (Salties) are the more aggressive of the two. Both types are EVERYWHERE- even in a few centimetres of water. The birds didn't seem too upset by their presence, but the people in the boat kept all limbs inside! At one point we saw something Ian had never seen before, a Freshie resting after the exertion of capturing a large catfish before opening its jaws to swallow it whole. The fish was actually still flapping!